I rarely get sick but I think the bug won this time and I got a cold. Since I introduced Ninon’s beauty secrets, I’ve been more interested in old natural remedies that people used before we started depending on drugs. 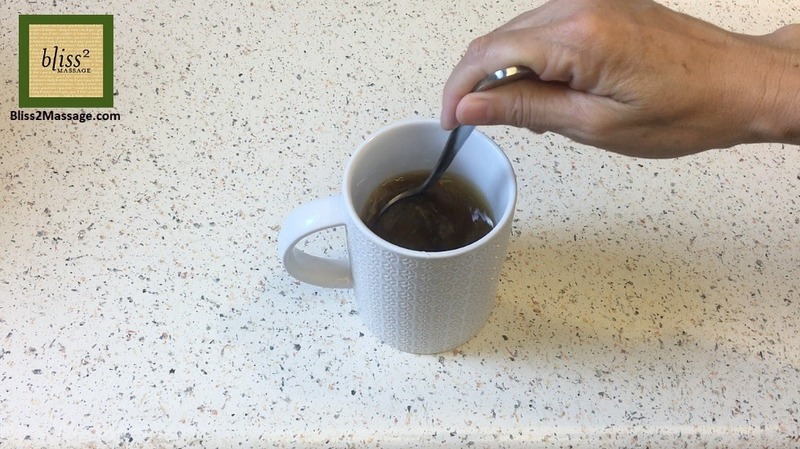 It wasn’t intentional but now that I’m sick I get to try some of those old remedies besides the acupressure for sore throat which I will put the link here and below. 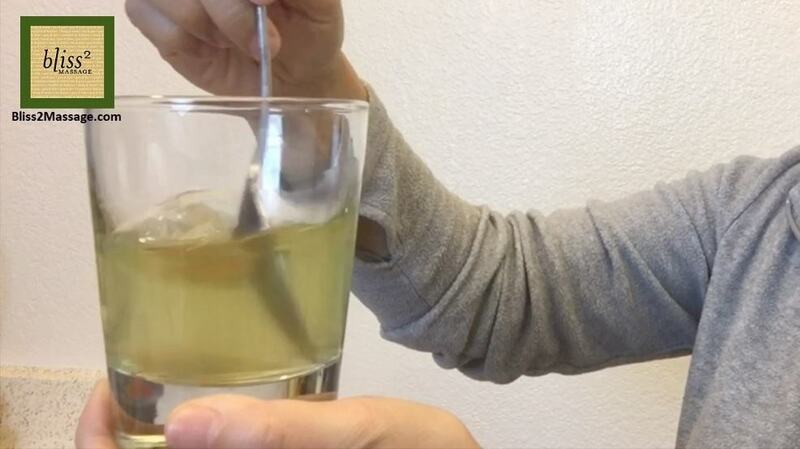 Here are some of the Japanese Grandma’s remedies for sore throat. The thing I have around my neck, it’s not a new fashion statement. It’s an onion wrap. 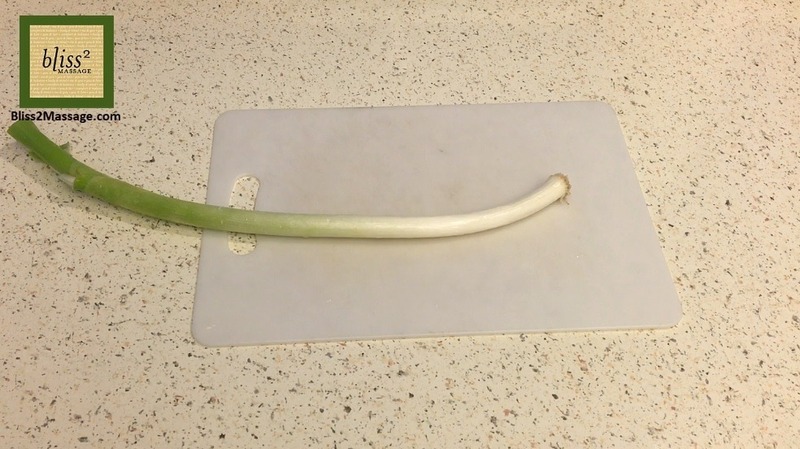 It’s a kind that’s very long and often referred to as White Onion or Tokyo Onion at Japanese markets. You chop up the white part and either use it raw or roast lightly to make it soft. As you can see it’s soft enough that the inside popped out. You can wrap them in a gauze or thin towel. I had a Turkey Stuffing Bag which fit perfectly around my neck. When I gargle, I used to just gargle with water with sea salt but I’ve learned gargling with green tea is very good for your throat. So I’m combining the two and gargling with salt green tea. The polyphenol in green tea called catechin is antiviral, antibacterial and helps to even stop the spread of flu virus. I’ve also read this is true for black tea, not just green tea. So if you only have black tea at home, gargling with black tea is worth a try to stay healthy. 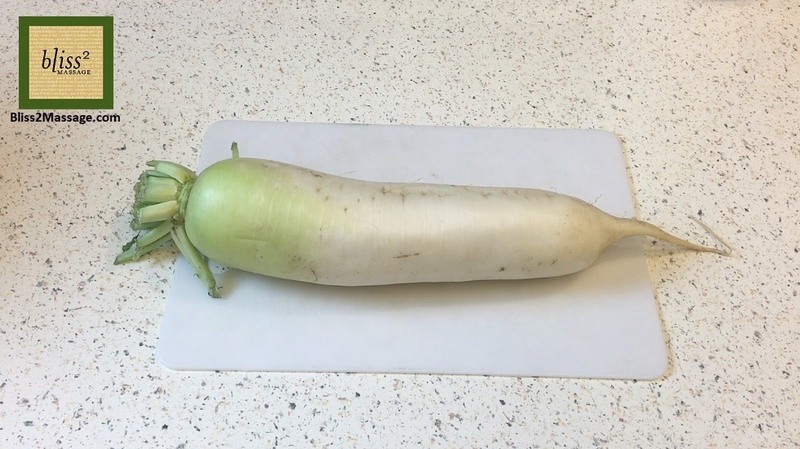 This is daikon radish. It has antibacterial and antiviral properties especially for respiratory issues such as phlegm and sore throat. It’s also fibrous, diuretic and has digestive enzymes so it’s good for digestion and detoxing too. The best way to consume for sore throat is to grate the part closer to the tip which has more spicy substance which is good for sore throat. This is ginger. Ginger is also antibacterial. Raw grated ginger is very good for sore throat. But if you heat it up it helps to improve the immune system and combat the virus by raising the body temperature from the inside. Put 3 tablespoons of raw grated daikon radish in a cup. Add 1 teaspoon of grated ginger. Add green tea. Add some soy sauce. The recipe called for 1 tablespoon. And drink it up. 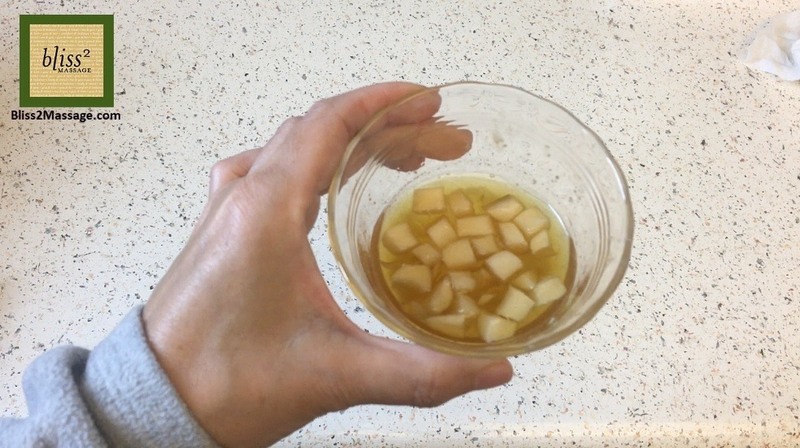 I’ve also cut up the daikon radish and soaked them in organic honey. Leave it for several hours to overnight. 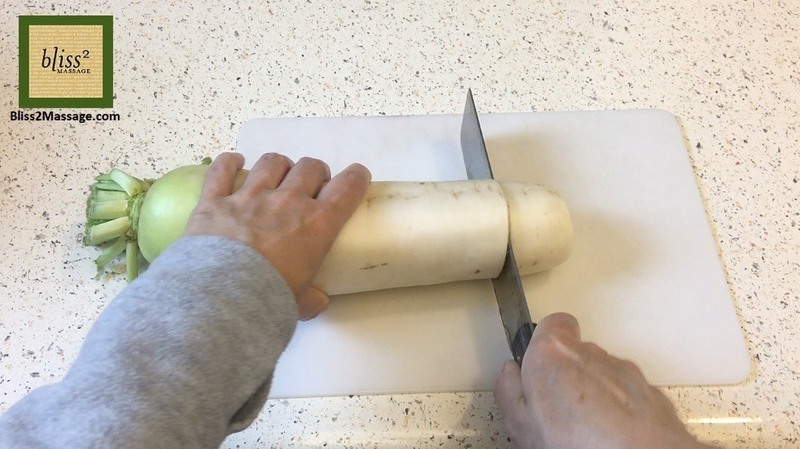 After several hours the water from the daikon comes out and it becomes watery. Eat this syrup as is or add it in a hot water. You can also add lemon to boost Vitamin C and/or ginger of course. 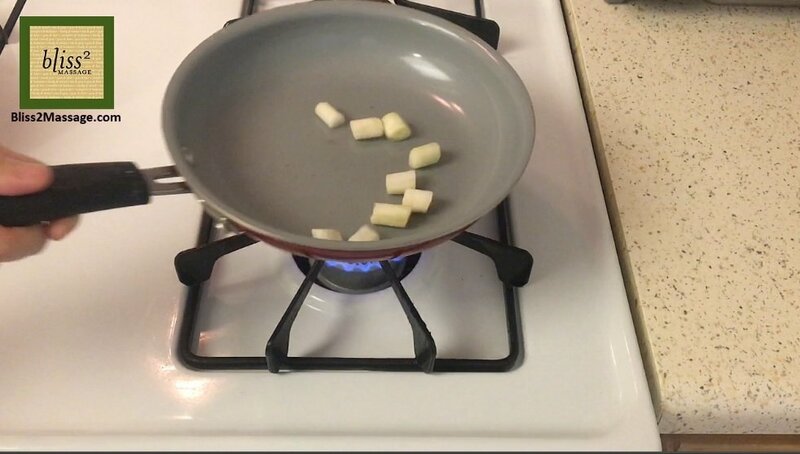 I’m going to eat the honey pickled daikon with rice later. I’ve been wearing this for several hours now and I think it’s helping to soothe the sore throat. (Sore throat came back after I took it off!) I occasionally smell the roasted onions but I’m not going out today so it doesn’t bother me. Plus my nose is used to onion smell from Ninon’s beauty cream. If you have no idea what I’m talking about, I’ll put the link here and below. I would love to hear if you have Grandma’s remedies for sore throat in your country or region. Nowadays we can prove it scientifically why it works but back then people just figured out by trial and error. I think we can learn a lot from the old wisdom. I am also curious if you are interested in these kinds of old natural Japanese remedies for different health issues. Let me know in the comments below.